Sometimes you're looking for a quick getaway, one that doesn’t keep you in the car so long that your bum goes numb. You've done Fort Worth; Austin is too far; so where do you go? There are no fewer than seven North Texas towns that you need to spend more time in, with everything from wineries to llamas, and explorable in less than one gas tank. So turn up the Willie Nelson, gas up the the wood-paneled station wagon, and hit the open road. Why it's so great: In the past, Celina was known for having one of the most successful football programs in Texas, and... well, that’s about it. 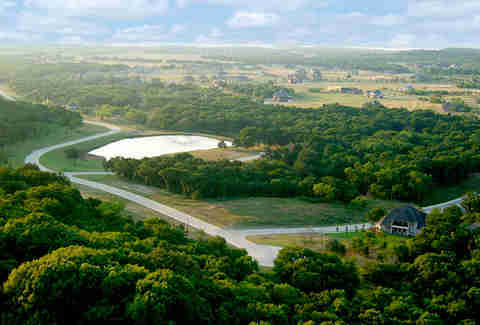 Today, Celina is experiencing massive growth and quickly becoming a sought-after home-buying destination. For now, Celina is still very much a small town, and one that makes for a perfect day trip, situated about 30 minutes from North Dallas. Check out the Texas Farmers Market on select dates in the historic Downtown square for some fresh veggies and fruits. While you’re there, be sure to have some homemade Texas pie at Lucy’s on the Square. Must-do: Stop by Eden Hill Vineyard & Winery and do some wine tasting. If you stop in on the weekends, you might be able to catch a quick tour of the vineyard. Be sure to taste the outstanding Albarino~Viognier; it won a gold medal at the San Francisco International Wine Competition. 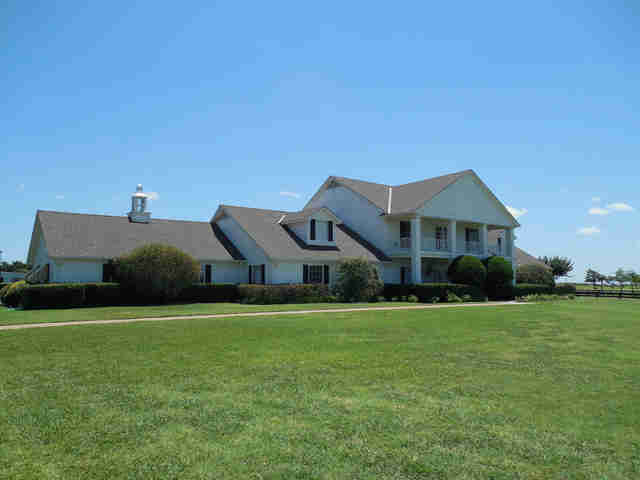 Why it’s so great: Parker is home to famed Southfork Ranch from the TV series Dallas, so make sure you take a tour. Don't leave before trying Kelly Family Farms burger stand, which is located in the middle of a pasture and has quite possibly the most delicious burgers in Texas, all made from grass-fed beef. No word on if the grass-fed beef comes from the cows in said pasture. Must-do: You can’t visit Parker and not visit the llamas. Yes, the llamas: Dalai Llama, Drama Llama, Barack O’Llama, Como T. Llama, and Bahama Llama to be exact (all actual llama names). At animal adventure company ShangriLlama, you can pet them, walk with them, and learn about them from head to toe, er, hoof. Why it’s so great: Known as the "hill country of Dallas," Cedar Hill is a unique town about 25 minutes south of Dallas with an elevation about 800ft above sea level. But aside from having an Austin-like topography, it boasts a charming Downtown square and tons of outdoorsy activities. Start by taking a stroll in the plaza, and make sure to snap a picture in front of Cedar Hill Barbers, previously the location of the famous Cedar Hill Bank, once robbed by Raymond Hamilton, a sidekick of Bonnie and Clyde. For your caffeine fix, stop by White Rhino Coffee House. Whatever you do, don’t leave without visiting Cedar Hill State Park, home to over 1,826 wooded acres, along with bobcats, coyotes, foxes, squirrels, armadillos, and raccoons. Must-do: If you’re a mountain-bike rider, and even if you’re not, Cedar Hill has over 45 miles of multi-purpose trails and bikeways. The DORBA Trail, located in Cedar Hill State Park, is known for the best mountain biking trails in the state, which are also used for hiking if you prefer two feet instead of two wheels. Why it’s so great: Once a small bedroom community, McKinney is now the 19th most populous city in Texas. It’s also consistently rated one of the best places to live in DFW, and is located only 37 minutes from North Dallas. But what makes this town so appealing is its dedication to preservation. The Downtown square is filled with quaint coffee shops, small boutiques, and great restaurants. For a slice of Texas wildlife, the Heard Natural Science Museum offers a 289-acre wildlife sanctuary where you can get up close and personal with nature. 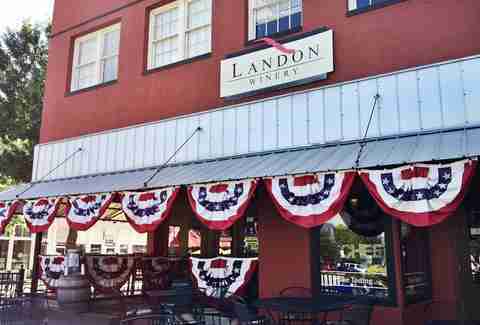 When you’re ready to get up close and personal with a drink, stop by award-winning Landon Winery in the square and enjoy some excellent local wine and possibly some live music. Must-do: McKinney is home to Franconia Brewing Company, so spend a day taking a tour of the brewery, and be sure to try Franconia Lager. It’s the stuff dreams (and hangovers) are made of. Why it’s so great: It’s known for its strange name, but Waxahachie is also known for its Victorian architecture and Gingerbread homes. There's even an annual Gingerbread Trail Festival with a tour of the homes. Be sure not to miss the picturesque Richardsonian Romanesque courthouse, which is said to be a beautiful example of Texas' older courthouses. When you're done, stop in for a cold one at College Street Pub, a laid-back British-inspired pub favored by local Waxahachians. 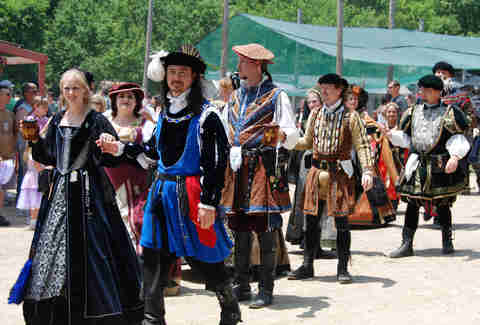 Must-do: The absolute best time to visit Waxahachie is during the Scarborough Renaissance Festival. The fair is held just south of the town and opens annually during the months of April and May. Grab your tights and enjoy! 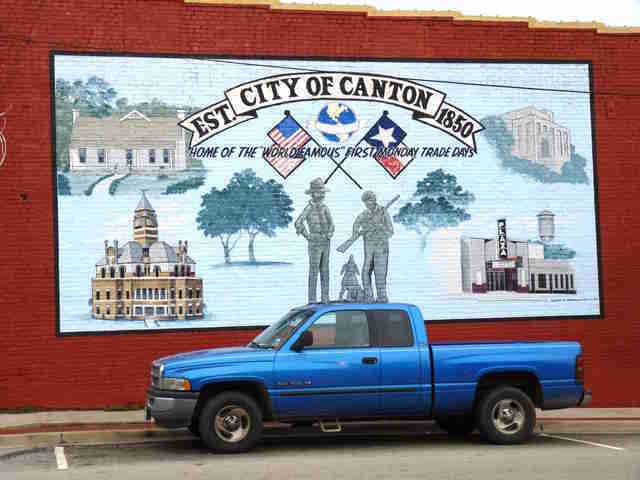 Why it’s so great: Aside from being home to the only water park in East Texas, the main reason people flock to Canton is for First Monday Trade Days, an enormous flea market. The market is held on the Thursday, Friday, Saturday, and Sunday before the first Monday of every month. It’s one of the oldest and biggest flea markets in the United States. From crafts to furniture and oddities, there’s something for everyone. Just be sure to leave room in your car for all the junk… um… stuff you’ll be bringing back home. Must-do: Visit YesterLand Farm during Christmas. It’s a farm that sells Christmas trees, and has pumpkin patches and corn mazes for the kiddos. Why it’s so great: During Prohibition, Glen Rose was known for its production of moonshine, and even became known as the "whiskey woods capital of the state." Sadly, it’s no longer known for its whiskey, but for dinosaurs. 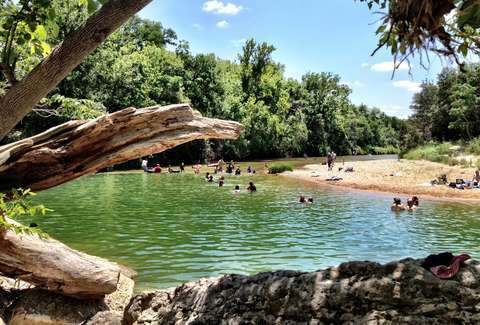 Check out Dinosaur Valley State Park, where you can search for dino tracks, picnic, hike, bike, fish, and even ride your own horse in over 100 acres of the wooded park. When you're done exploring, make sure to dine at Riverhouse Grill, the family-owned restaurant offers some small-town hospitality and has some of the best fare in the city. Must-Do: Cue the Jurassic Park theme song and head to Fossil Rim Wildlife Center. 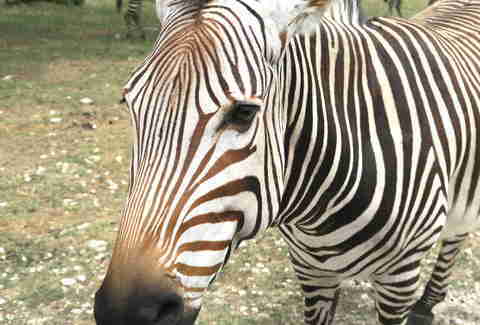 Fossil Rim is a 1,800-acre wildlife preserve open to the public. Be sure to have a four-wheel drive or SUV, and make sure you stop by the store to pick up some feed, because part of the appeal is that you get to feed the animals from your car. There are giraffes, zebras, and many other hungry animals awaiting your visit. Just don’t get out of the car. David Maez is a Thrillist contributor who hates numb bums and loves his family Truckster. Follow him @davidfmaez.